Remember all the times one of your big men got switched onto a guard and they isolated on the perimeter? The guard probably got into the lane for an easy score right? This was probably because your big man was lost and had no idea what to do. get them used to playing defense on the perimeter. Objective: This drill has two goals. One for the guards, and one for the big men. The guards are competing against each other, and the big are competing against each other. 1. The guards must create space and get a good shot. 2. The big men must contain the guards and defend the shot. Set Up: You will need 4 people that play big men on your team. 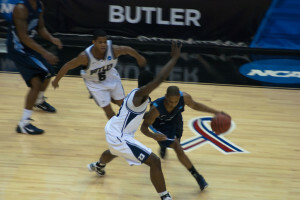 Put them on the free-throw line extended on both sides of the court on both ends of the court. Then get the rest of your team to line up in front of them. 1. Make sure you only run one group at a time on each end of the floor. If you run them at the same time they will get in each others’ way. 2. 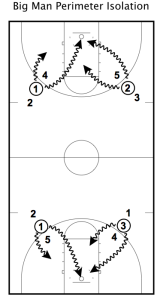 Start the drill by having a group at each ends of the court go first. The guard will either get a score, or the big man will get a stop. Then they clear out and the other group goes. There is a scoring system which I talk about after these instructions. 2. Once a guard has played against one of the bigs they move onto the next one. Make sure you have an order system so that a large group of people aren’t backed up in the same line. I recommend telling the players to rotate clockwise. As long as your players don’t deviate from the system, the groups should stay even the entire drill. 5. Each guard plays against each big man twice. So they do two full rotations of the groups. Scoring System: The guards all get one point when they score and the bigs all get one point when they get a stop. Assuming that they all stick to the rules of the drill and play each other twice the drill should be even for all players. Who ever gets the most stops from the big men is the winner, and who ever scores the most points from the guards is the winner. The main purpose of the drill is to teach the big men to use their length to defend. We know they’re going to be disadvantaged in quickness so they need to focus on defending using their strength against guards: length. The first thing you’ll find they do is play the offensive player like any other guard would… close. Big men can’t do this. They need to back up as much as they can while still being able to defend a perimeter shot if one is taken. A perimeter shot with a hand in their face is much better than the guard blowing by them and getting to the hoop and creating. Guards are working on their ball-handling and ability to create separation between them and the defender using the dribble. Make sure the big men stay in a low stance. Do you have any suggestions on how to improve this drill? Let me know in the comments.